Kevin Smith‘s comedy series, Hollyweed, may or may not see a full season, depending on how fans value it. The filmmaker-actor has teamed with Rivit TV to release the show’s pilot and its fate is up to those who watch it. Nearly three years ago, my friends and I made a pilot for a show called Hollyweed. It wasn’t at all groundbreaking but it was fun to make: essentially, it was Clerks in a weed store, with comedian Donnell Rawlings and me as the middle-aged knuckle-heads behind the counter. The idea was to base the episodes in a medical marijuana dispensary and use Los Angeles as a canvas for our characters. We shot the pilot in January of 2016 and it turned out better than I’d hoped. The future was looking bright for Hollyweed - until we ran into a slight speed bump: no network wanted the show. And so like many pilots before it, Holly-weed didn’t become a series - it became a digital file that sat on my laptop, where I’d watch it from time to time as a reminder of what might’ve been, daydreaming of trying again one day. Then I nearly dropped dead of a heart attack and decided one day is today! And now, the good folks at @rivit_tv are giving me and my Hollyweed dreams a second chance, as they put the power to green light our little weed sitcom in YOUR hands! 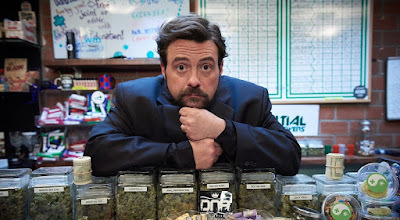 Hollyweed starring Kevin Smith, Donnell Rawlings, Frankie Shaw, Jason Mewes and Ralph Garman.